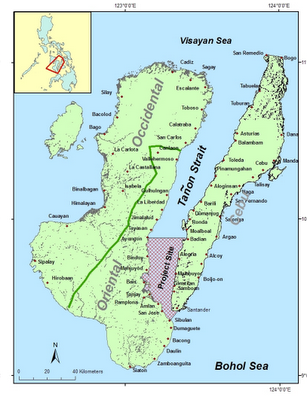 Click HERE for the Cebu and Bohol Earthquake update as of October 15 2013. Close to 900 aftershocks recorded in Negros and Cebu Province, Philippines. As Phivolcs has already warned residents near the epicenter that there could be more quakes (aftershocks) in the next few weeks. Check back later for updates. According to Philstar news website, death toll from the magnitude 6.9 earthquake that struck Negros and Cebu provinces yesterday has increased to 52, as local officials announced today. A strong earthquake with a magnitude of 6.8 intensity happened at 11:49 a.m. in the central visayas of Philippines speciffically in Negros and Cebu Region killed at least seven people Monday (February 6, 2012). The earthquake destroyed buildings and triggered landslides that buried dozens of houses and buildings made some residents trapped of Negros Island. According to the news report, the effect of earthquake killed at least 5 people and 29 people still missing as of today. Philippine Institute of Volcanology and Seismology (Philvolcs) measured the earthquake at magnitude-6.9. In sunstar news, this earthquake made people running in the streets, cars were abandoned and traffic was jammed following reports that the seawater was rising in the coastal areas of Cebu City. The Philippine Institute of Volcanology and Seismology (Phivolcs) issued tsunami alert 2 over the east coast of Negros and western Cebu. It warned that the quake could trigger 3-foot (1-meter) waves. The Pacific Tsunami Warning Center did not issue a warning. A child died when a concrete fence of a house collapsed in Tayasan town in Negros Oriental province, said Benito Ramos, who heads the Office of Civil Defense. Mayor Ernesto Reyes of Guihulngan City, also in Negros Oriental, reported that as many as 30 houses were buried by a quake-triggered landslide.Reyes said four people were killed in the landslide and 29 more were missing. “I felt the building shaking, so I rushed out of the building. Our computers, shelves, plates, the cupboards, water dispenser all fell,” he said. President Aquino's spokesman said to the authorities did not force people for evacuation but must be vigilant enough to those along the shore where tsunami alert was its effect. The Philippine Institute of Volcanology and Seismology (Phivolcs) issued tsunami alert 2 over the east coast of Negros and western Cebu. It warned that the quake could trigger 3-foot (1-meter) waves. The Pacific Tsunami Warning Center did not issue a warning. 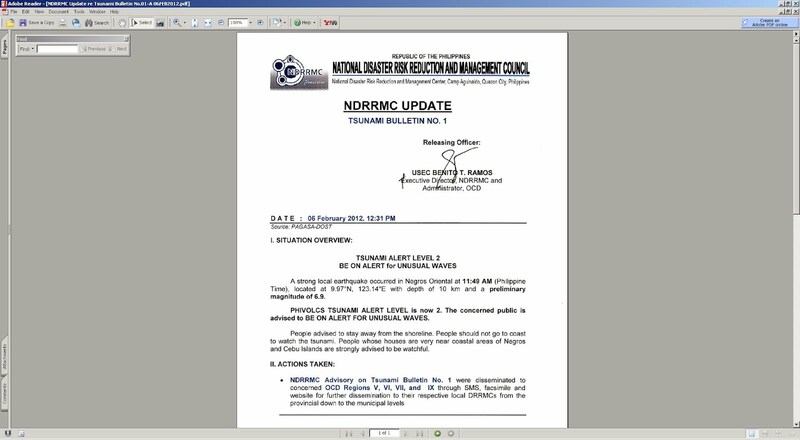 The screenshot below is the latest update after earthquake effect by the National Disaster Risk Reduction and Management Council - Republic Of The Philippines. Click to have a clear view on the screenshot. We are hoping that there will be no more earthquake and tsunami activity where everything will be back in normal condition. 2 Chronicles 7:14(NIV)14 if my people, who are called by my name, will humble themselves and pray and seek my face and turn from their wicked ways, then I will hear from heaven, and I will forgive their sin and will heal their land.